Islamabad- 14 November 2018: Pakistan’s No.1 Data Network, Zong 4G, the largest and fastest growing telecom operator of the country; is committed to enhancing its state of art network with the latest technology. In addition to revolutionizing the 4G ecosystem in Pakistan, Zong 4G is leading to facilitate its’ customers at every front. With the company’s unprecedented customer-centric approach, Zong 4G is striving to continuously augment its customer care channels through automation & innovation for responding to the growing needs of its customers. Advancing modernization in customer care, the 310 Smart Interactive Voice Response (IVR) is easy to use for customers. By simply dialing 310, the customers are connected to the automated computer system that interacts with callers through the use of personalized voice prompts and connects to a self-service menu option where the consumers can access with assistance from pre-recorded messages. 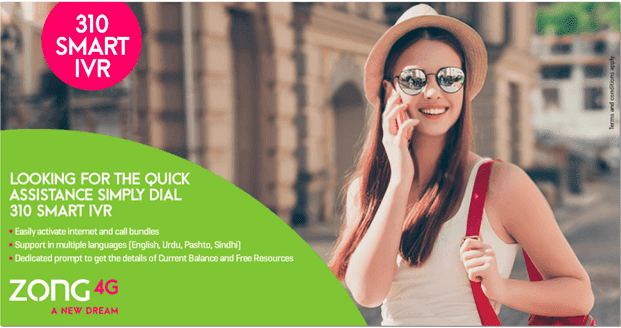 Impressively, this IVR is available across-the-board for all type of Prepaid & Postpaid customers, who can use it in four major languages; English, Urdu, Pashtu, and Sindhi. The 24/7 service allows the customer to obtain the information they are searching for without speaking to the customer service representative. 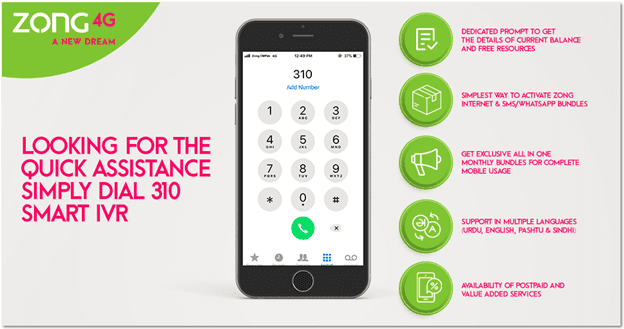 Responding immediately to a caller, the 310 Smart IVR avoids making customers endure long hold times by guiding them about current balance, package plan, credit limit, current month bill & free resources information. Likewise, the special features include activation and deactivation of internet bundles, SMS packages, voice offers or VAS. Another added feature of the 310 Smart IVR which has captivated user’s attention, is “Pull SMS”. Zong 4G subscribers can get desired information about products & services in the form of SMS from IVR) in real time without any cost. To get information in SMS, the customer has to dial 310, press 2 and select the relevant product menu by following simple instructions. To receive product information through SMS, Press “3”.